A group of six young boxers, representing all six of the local authorities which make up the Liverpool City Region Combined Authority, are jetting off to Louisville today, as part of the next stage of a sporting and musical exchange between the Liverpool City Region and Louisville, Kentucky. The exchange celebrates and strengthens cultural links between the Liverpool City Region and Louisville, Kentucky, exemplified by the iconic photograph of The Beatles meeting Muhammad Ali on 18 February 1964. In the first part of the exchange, Carly Johnson, an up and coming singer from Louisville, travelled to the Liverpool City Region to play gigs at the legendary Cavern Club and the influential Liverpool Sound City festival. Now, the young boxers, aged between 15 and 17, will travel to Louisville to train at the TKO gym and visit the Muhammad Ali Centre, whose mission is to preserve and share the legacy and ideals of Muhammad Ali, to promote respect, hope, and understanding, and to inspire adults and children everywhere to be as great as they can be. Talking about the exchange, Liverpool City Region Metro Mayor Steve Rotheram said: “In The Beatles and Muhammad Ali, Liverpool City Region and Louisville produced two of the biggest cultural icons of the 20th century. Greg Fischer Mayor, Louisville Metro Region, said: “This exchange builds on the Transatlantic connection that Louisville and Liverpool established through the meeting of world-changing artists and a barrier-breaking athlete. 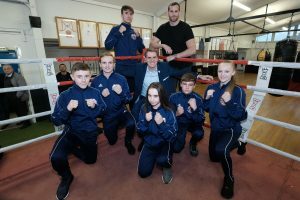 The young boxers have been brought together by the Amateur Boxing Association, which will also provide two coaches to lead the Liverpool City Region team.